Lots of parties and events in Tenerife in June 2018 - starting with Corpus Christi celebrations and continuing with the Midsummer Night Bonfires, plus other concerts and fiestas. Many of the towns in Tenerife will have something planned for this religious celebration. 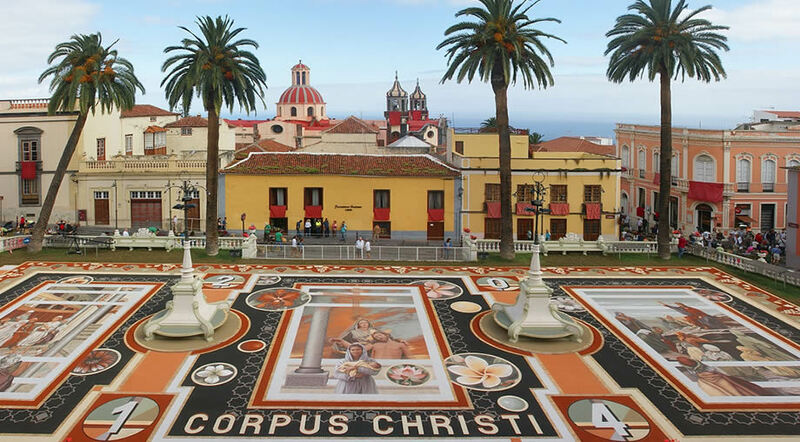 The carpets are being laid out the night before the Corpus Christi day and the most impressive street carpets can be seen in the north of the island in La Laguna and La Orotava (7th of June), but also in Los Silos, Tacoronte, El Sauzal, Guia de Isora and Adeje (on the 2nd and 3rd of June). In Plaza de Santa Catalina there will be a country ball - Baile de Magos with several music bands from the municipality. Romeria en honor de San Isidro Labrador (San Isidore the Labourer). At 12:00 will take place the religious ceremony and then the pilgrimage that starts at Santa Catalina Church and goes towards La Alhondiga. After this, there will be a popular fiesta in the square in front of the church of Santa Catalina. On this special and magical night several towns in Tenerife will have bonfires on the beach and you can attend to either one of this events if you want to take part in a local tradition: Puerto de la Cruz, Guia de Isora, El Medano, Punta del Hidalgo and Radazul, plus several others, but the ones mentioned have the best atmosphere.